Vox Panther Model Solid Body Electric Bass Guitar (1966), made in Italy, sunburst polyester finish, mahogany body, maple neck with ebony fingerboard, original grey hard shell case. While there are not many bass guitars we'd describe as "cute," the diminutive Vox Panther certainly qualifies. 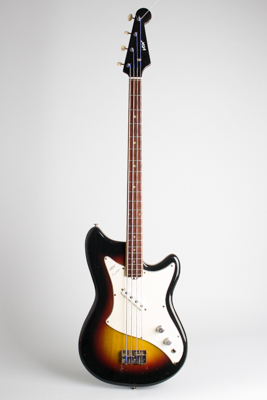 The Panther is the Italian-made descendant of one of the original JMI/Vox student basses models made in the UK in the early-mid 1960s, the "Bassmaster." Although still definitely built to a price, this is a well-designed and quite useful lightweight bass. The single large Vox bass pickup is set at an angle under the strings (to fit the very narrow spacing) and is controlled with single volume and tone knobs. With a small, vaguely Fenderesque body and VERY thin 30" scale neck, the Panther is extremely handy to play, and to a full-size player feels almost toy-like. It was designed for young student and teenage garage band use, and remains an excellent starter bass, suitable for kids or players with small hands and even as a knock-around recording bass. With a sunburst poly body finish and jet black neck (which is fairly rare -- most were finished in natural), this little bass still looks great. A very playable piece of Vox history, and just a cool little bass. Like most Vox-branded instruments sold in the US, this was built at the Eko factory in Recanati, Italy for the American distributor, Thomas Organ. Vox's parent company JMI (Jennings Musical Industries) in Dartford, Kent was already overstretched by 1964 supplying Vox amplifiers to the UK and world markets, so instead of expanding their meager guitar-making facilities, Jennings outsourced the great bulk of instrument production to the Italian firm. These Eko-made Vox guitars are more consistent than their English cousins, and in many cases are better playing instruments. By the time Thomas in California formalized American distribution of JMI's products in 1965, nearly all Vox guitars would be of Italian parentage. They were quite popular in the US at the time and remain cool, playable relics of their period, always brimming with the mid-'60s vibe. This bass remains in all-original condition with some dings, dents, and scratches to the finish (mostly on the back) but no major alterations, damage, or repair. Like most Eko-made Vox guitars, the pickguard has shrunk up a bit over time, and has a missing tip at the bottom corner by the jack, with the securing screw re-located. A good-playing and sounding if slightly eccentric bass; the stamped bridge cover is missing, but all else is present and complete including the original grey Vox case. Excellent - Condition.